Most OSHA standards require the monitoring of worker chemical exposure levels through the measurement of chemicals in the ambient air of the worker’s breathing zone. 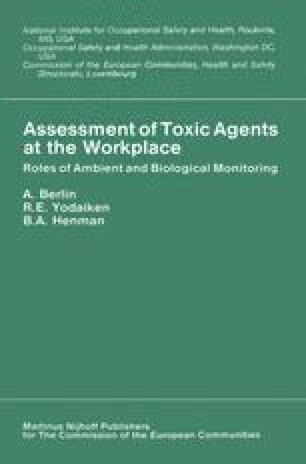 Biological monitoring is expected to become increasingly important as a tool for evaluating worker exposure to chemicals. Frequently, the OSHA chemist is involved in adapting chemical methods or sampling techniques to OSHA’s enforcement needs. A sample storage stability problem for 2-butanone (MEK) was solved to meet OSHA’s needs by substituting silica gel for charcoal as the adsorbent. A second sample storage stability problem for hydrazine was solved by using Gas Chrom R coated with sulphuric acid in place of silica gel coated with sulphuric acid as the adsorbent. A third problem was the development of analytical techniques specific to three benzidine-based dyes. “Stop gap” analytical methods were developed utilising pairedion chromatography and separation by high performance liquid chromatography for C.I. Direct Blue 6, C.I. Direct Black 38, and C.I. Direct Brown 95. These examples show the value of a close working relationship between the analytical chemist and the industrial hygienist in solving workplace sampling and analytical problems.